1This paper will follow and contextualize the itineraries of two Greek-speaking individuals of the Eastern Mediterranean. Eugenios Voulgaris (1716-1806) and Μarinos Harbouris (1729-1782) both came from the Ionian Islands and followed similar paths in their search for social accomplishment, a search that brought them to the court of Catherine the Great. In an era of vivid intellectual activity, the two men’s knowledge quests played significant roles in their mobility patterns: both presented themselves to the Empress as agents of useful and reliable knowledge. At the same time, however, they represented radically different perceptions of what such knowledge would be about. 2Eugenios Voulgaris was a man of letters, and he paved his way to Catherine’s court by literary work, translations and an intricate gift exchange. In Greek historiography he is known for renovating philosophy and as the author of treatises in metaphysics, logic, literature, religious studies and natural philosophy, which shaped 18th-century Greek intellectual life. His work brought together the attainment of the Enlightenment with the neo-Aristotelian philosophy that had dominated Greek intellectual life since the early 17th century. The scientific discourse resulting from this synthesis formed one of the many diverging epistemic endeavors that marked the early life of modern science. What gave this discourse its particular character was that it epitomized the life and career expectations of a man who was continuously on the move. In trying to bridge different philosophical, religious and political visions, Voulgaris crossed a variety of intellectual environments, and his travels point to the importance of circulation as a condition of knowledge production. 3Marinos Harbouris’ intellectual trajectory was different. He achieved Europe-wide fame when in 1769 he published his report on how he had engineered and executed a plan to transport a 2,000-ton stone to serve as the base for a statue of Peter the Great in Saint Petersburg. The achievement earned Harbouris international acclaim and Russian titles but small financial gain, so he put his entrepreneurial mind to other ventures. His ambitious plans involved transplanting crops and colonial plants such as indigo, sugar cane and coffee to his native Cephalonia. He proceeded with the implementation of his plan under the auspices of the Russian Empress and with the approval of the Venetian authorities. Together with a French entrepreneur, he elaborated cultivation and manufacturing methods for the transplanted colonial species – a very different kind of useful and reliable knowledge than that produced by Voulgaris. 4The paper aims to show that, although the kind of knowledge produced arose from different pursuits and fields, in both cases it was the result of the simultaneous circulation of people, local intellectual traditions and material objects and that the extended patronage and commercial networks of the time enabled individuals to re-invent themselves as agents of a new ethos that foreshadowed an equally multifaceted modernity. 6Voulgaris’ fame remained intact for more than a century. He authored books on metaphysics and logic, literature and theology, history and politics, and, most importantly, some of the most influential scientific treatises of his time. These treatises attempted to merge the attainments of modern European thought with the neo-Aristotelian philosophy that had dominated Greek intellectual life since the early 17th century2. In the late 1940s, however, when historian Constantinos Dimaras (1904-1992) coined the idea of the “Neohellenic Enlightenment” as a period that marked the linking of 18th-century Greek society with the European (particularly French) Enlightenment, Voulgaris’ place on the intellectual map changed drastically. For Dimaras, Voulgaris was a progressive scholar who grew conservative as he got older and more established3; for other historians, he was a transitional figure who could not fully appreciate European scientific progress because of his inability to distance himself from the philosophical and theological commitments of his native cultural context4. Voulgaris was the hero of an unfulfilled modernization. 7On closer examination, however, Voulgaris turns out to be quite typical of an era characterized by “multiple engagements” and the agency of “polycentric communication networks5”. His work epitomizes the life and career expectations of a man who was not a narrowly trained and acutely oriented “scientist”, but who instead moved in a variety of intellectual environments and tried to bridge different philosophical and political visions. Like many scholars of his time, Voulgaris was a “go-between6”, and placing his story in the historiographical context of circulation helps elucidate significant parts of his intellectual agenda, parts that usually go unnoticed by contemporary historians. 8Voulgaris traveled and wrote a lot, and like many of his contemporary European scholars, he was involved in a broad set of intellectual pursuits, but his goal was neither the search for scientific knowledge nor its circulation. Instead these resulted from his efforts to establish himself in a variety of social, intellectual and political environments across a changing Europe. In this respect, his travels may serve as an example of how the circulation of people contributed to the production of new knowledge and the institutionalization of modern science. 9We can divide his travels into three phases. During the first phase, he traveled to Italy and within the Balkans, keeping an eye on the latest developments in natural philosophy. Intellectually, he clearly moved westward. After a much disputed stay in the University of Padua, Voulgaris established himself as a renowned teacher of higher philosophical courses in schools founded and funded by rich merchants in Epirus, Western Macedonia, Mount Athos and Constantinople7. He represents a new generation of scholars who claimed social power on the basis of their intellectual skills. This endeavor required overcoming the limitations of traditional philosophical teachings and creating a new discourse in which the attainments of the new natural philosophy came to terms with the prerequisites of the local philosophical and religious traditions. 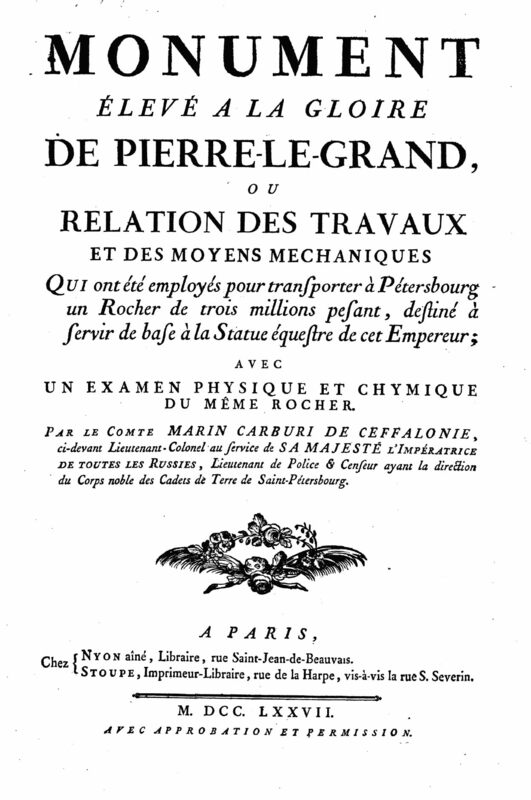 In the period from 1742 to 1762, Voulgaris produced the greatest part of his scientific work. He compiled textbooks based on some of the most important philosophical and natural philosophical works of his time (including, among others, the works of Wilhem ’sGravesande, Petrus van Musschenbroek, Samuel Clarke, Émilie du Châtelet, Antonio Genovesi and, of course, Isaac Newton and John Locke). 10His intellectual production was primarily aimed at securing a position in the patronage networks of the emerging Greek society. The commercial social groups of the South-Western Balkans as well as the conservative but Europeanized Phanariots of Constantinople tended to sponsor scholars who were involved with modern philosophy and who experimented with educational programs that transcended the narrow Aristotelian curricula. However, neither scholars nor their intended patrons had reached a consensus on a new intellectual identity. Instead they debated a variety of educational patterns that reflected their diverging visions for the future of the decaying Ottoman Empire. Within this atmosphere, Voulgaris like many of his contemporaries, focused on the new natural philosophy as a means to enrich the exegetical power of the established Aristotelian tradition through the methodological attainments of modern empiricism8. 11Notwithstanding his ambitious intellectual agenda, Voulgaris did not succeed in establishing himself in the center of the Eastern world. Unlike his contemporaries whose careers culminated in Constantinople, Voulgaris was unable to settle down for long. After intense disagreements with the environment of the Ecumenical Patriarchate, he departed for central Europe to start a second career. 12Fairly early in this second phase, Voulgaris began to perceive Catherine the Great as an alternative patron within the delicate balance of powers of the Orthodox world. But when he arrived in Leipzig, he hadn’t yet formalized his plan to pursue the patronage of the Russian court. So in 1764 we find him supervising an ambitious publishing project. Education was still his focus and the first books he put forward were intended for teachers and students involved in Greek higher education. At the same time, he started building a network of relationships that would lead his career outside the limits of the Ottoman Empire. He met with the mathematician Andreas von Segner (1704-1777) and translated into Greek – to the great surprise and disappointment of his contemporaries9 – his Elementa arithmeticae et geometriae. When, some years later, Voulgaris departed for Catherine’s court, Segner provided him with an introductory letter addressed to his friend Leonard Euler (1707-1783), a renowned member of the Saint Petersburg Imperial Academy10. 13While in Leipzig, the variety of Voulgaris’ intellectual interests was reflected in the variety of his publications. Surprisingly, however, the work that eventually marked his new orientation was a legal code. Around 1770, Voulgaris met the Orlov brothers (Grigory Grigoryevich Orlov, (1734-1783) and Alexei Grigoryevich Orlov, (1737-1808), Catherine’s military courtiers, who were then working to foment an uprising of the Ottoman Empire’s Christian populations. Through them, Voulgaris became aware of Empress’ desire to have the Nakaz, the legal code she wished to put into effect in the Russian Empire that would result from the Russian-Ottoman wars, translated into Greek. Voulgaris not only translated the Nakaz but also enriched it with a preface addressed to the Greek-speaking Orthodox populations of the Ottoman Empire (fig. 1). Not only did he praise the virtues of enlightened despotism, he also described Catherine as the mother who would unite the Orthodox nation irrespective of the ethnic differences among the various populations11. Figure 1: The bilingual edition of Nakaz containing Voulgaris’ translation. 14This was his ticket for the third phase, which started in the early 1770s in Saint Petersburg. Voulgaris spent the rest of his life as a member of the Russian court, traveling within Russia, but never going back to central Europe or to the Greek-speaking areas of the Ottoman Empire. Upon his arrival, he quickly ascended to the throne of Archbishop of Slavensk and Kherson. In 1776, he traveled to Poltava to take over the diocese and supervise the establishment of the Greek-speaking populations who had moved there after the unsuccessful uprising the Orlovs had incited in the Peloponnese. Due to political disagreements, he resigned three years later, but he remained in the area until the late 1780s, when he returned to Saint Petersburg to spend the rest of his long and prolific life12. 15Although during his second career in Russia Voulgaris seemed to have given up his scientific pursuits, we should not see that as a lack of interest. Indeed, there are at least three instances that testify to the contrary. As mentioned, when Voulgaris left Leipzig, he obtained a letter of recommendation to the famous mathematician Leonard Euler. It seems that he initially thought that in Saint Petersburg, in the fertile environment of the famous local academy, he would be able to further his scientific pursuits. Evidence suggests that he did not realize this ambition; if he did, the extent is unknown. But we know (and this is the second instance attesting to his interest in the sciences) that in 1776, the same year he departed for Poltava, he was elected an honorary member of the Russian Academy of Sciences in absentia. The third instance is an enigmatic one, whose exact circumstances it has been difficult to trace. In 1788, while he still was in Southern Ukraine, he was elected a foreign member of the Royal Society of London, then headed by Sir Joseph Banks (1734-1820)13. Clearly Voulgaris continued to be acknowledged as a “man of science” and to suggest his intention to remain active in this area, since it is unlikely that he would be designated a member of the Russian Academy and the Royal Society of London without his involvement. 14 Stephen K. Batalden, Catherine II’s Greek Prelate…, op. cit., p. 29 and note 71. 17 Ibid., p. 80; Άλκης Αγγέλου, Των Φώτων Β΄…, op. cit., p. 248-249. 16However, he did not produce any scientific work during the years he spent in Russia. Before departing for Poltava, he mainly translated and composed political treatises intended to promote Catherine’s image as an Enlightenment persona and the powerful ruler who would guarantee the post-Ottoman European balance of power14. While in Poltava, he turned his attention toward religious issues, apparently connected to the ideological consolidation of the Greek-speaking populations who had moved there. He translated the guiding text of the Russian Holy Synod, the Spiritual Regulation of Feofan Prokopovich (1681-1736)15 into Greek. When he moved to Kherson, he turned to philological work, translating Virgil’s Georgics. He dedicated the translation to Catherine’s protégé Grigorii Potemkin (1739-1791), the powerful man of Novorosiya, hoping for his support for the revival of local Greek communities16. A few years later, another translation of Virgil helped Voulgaris re-enter the St. Petersburg intellectual scene. In 1791, the Russian Academy published his translation of the Aeneid, a work that was apparently aimed at providing an illustrious historical background for the Russian Empire’s expansionist ambitions17. 17Voulgaris had been indulging for a long time in theology, philology and, above all, politics. It would thus be reasonable to assume that his impact on Greek scientific life was limited. Not only was this not the case, in fact it was the development of his profile as a leading political and religious figure that gave his scientific work its significance. Indeed, what made Voulgaris representative of his time was his function as an intermediate individual. He crossed a variety of social environments and bridged different philosophical and political visions. In the realm of philosophy and science, Voulgaris assimilated the attainments of the Enlightenment into his native neo-Aristotelian context. This deprived them of their inherent empiricism, but linked them with the crucial goal of securing the integrity and continuation of philosophy. In the realm of politics, he combined his native cultural heritage with the vision of an Orthodox empire where the Greek culture and language would enjoy a distinct position. In the realm of religion, he combined his Orthodox faith with both his philosophical and his political concerns. On the one hand, he attempted to revive the religious dimension of natural philosophy by linking the traditional philosophical views of Nature with his contemporary natural theology; on the other, he crossed the borders between two different Churches in order to achieve a higher degree of state-guaranteed integrity for his Orthodox faith. 18In the end, it was this highly intermediate status that allowed Voulgaris to best express the intellectual and political ambiguities of the emerging Greek society. Thus it is hardly surprising that in 1805, aged 90, and just one year from his death, he ensured that all the major natural philosophical works he had compiled or translated between 1742 and 1762 went to press. As soon as Voulgaris stopped traveling, his works started inscribing their own trajectories contributing to the formation of a national consciousness, undoubtedly beyond the intentions of their author, but in accordance with the expectations of the social groups who gradually took the lead of the emergent Greek society. 19The story of Marinos Harbouris reveals the transfer and circulation of useful and reliable technical knowledge by scholars from the Ionian Islands; the importance of the Russian court as a centre of application of knowledge; and the role of Paris in the diffusion of knowledge and the expansion of Russian influence in the Mediterranean as knowledge acquired elsewhere was transmitted from St Petersburg to Paris and from there to Cefalonia. The story of Harbouris tells us how mobility contributed to the transfer of knowledge first from and then to the Ionian Islands, when the Mediterranean became a field of technical experimentation similar to ventures in overseas colonies18. Harbouris also played a role in Russian involvement in the Mediterranean in the late 18th century as an indirect agent of Russian interests, a representative of Russian “soft power” after the arrival of the Russian navy in the Mediterranean and the failed Orlov rebellion of 1770. 20Although Harbouris acquired considerable fame in his lifetime, only recently has his story come to the attention of Greek historians. In 1843, Anthimos Mazarakis included Harbouris in his biographies of “illustrious men of the island of Cefalonia”, and the 1999 reprint made historians of the Ionian Islands become aware of him19. Harbouris’ life story also inspired both a novel, “The Brothers Carburi” by Petrie Harbouri (2001) and an animated short film that focuses on Harbouris’ 1770 Russian engineering achievement20. Recently historians have given Harbouris some of the attention he deserves21. Beyond the biographical, stories such as Harbouris’ serve a broader educational purpose in the context of global histories of mobility, innovation and the social and political conditions that foster or inhibit the transplanting of knowledge and product and process innovations. Harbouris lived in a Greek-Venetian-Russian world or network that transcended conventionally defined east/west boundaries. Such an approach allows new historical actors to emerge in the history of science, actors who were scholars, but also adventurers, career-seekers and men motivated by their science, art or excellence in letters. These mobile actors applied knowledge acquired in one place to questions and situations encountered elsewhere. 21For both Voulgaris and Harbouris, Russia played a prominent role across their lives. There was a Greek diaspora of intellectuals and officers living in and working for the Russian Imperial Court – this included a group from the Ionian Islands, which helps explain the fascinating twists of Marinos Harbouris’s life. Following an alliance with the Ottoman Empire, in 1799 Russia took over the protection of the Ionian Islands and established the first semi-independent state, the Septinsular Republic. Before this formal takeover, however the Russians had expanded their influence in various ways, including instigating insubordination and rebellion among the Greeks in the Morea (Peloponnese and the islands). A number of Greek-speaking scholars had careers in the imperial Russian court as diplomats, merchants and army officers. Their stories not only explain why Harbouris moved to the Russian court in the first place and how he settled there, they also provide the context for Catherine the Great’s support for his venture in Cefalonia. 22The connection of the Greek intellectual life with Russia predated the 18th century. Following their studies in Venice and Padua, the monk brothers Sofronios and Ioannikos Leichoudes were sent by the Patriarch of Constantinople to Russia in 1685 to teach rhetoric and Greek at the Moscow Academy. Iakovos Pylarinos (1659-1718) studied Law and Medicine in Padua and travelled extensively in the Ottoman Empire, the Balkans, Crete, and Constantinople, where he served as doctor to the Prince of Wallachia, Kantakouzinos, eventually ending up in Russia as one of the doctors of Peter the Great. Athanasios Skiadas (1698-1796) also came from Cefalonia; he studied Philosophy and Law in Italy and was invited by Peter the Great to Russia. Skiadas succeeded Sofronios Lykoudis as teacher at the Slavo-Greek-Latin Academy of Moscow, studied in the Russian archives, and introduced reforms to the Russian education system22. Other Greeks who lived in Russia and were close to the court at the time were Georgios Skiadas, Andreas Kassis from Patras, Loukas Vagenas (Vaenas), Nikolaos Rodostamos from Corfu and Dimitrios Yannakopoulos from Constantinople23. Skiadas studied Medicine and Philosophy in Venice and Padua before he returned to Moscow, where he was appointed personal doctor to Empress Elisabeth. He died in 1803, one of the few second generation immigrants from Cefalonia. Michael Skiadas was born in Argostoli in 1740 or 1742. He travelled first to Russia, then studied Medicine, Theology, Physics and Mathematics in Leiden, briefly stayed in Paris and returned to Moscow after ten years. Skiadas was appointed professor of Physiology, Pathology and General Medicine at the Moscow Medical School in 1765. 23The person most connected to Harbouris was Petros Melissinos (1726-1796). Born in Russia, Melissinos studied engineering in Moscow and physics and mathematics in Paris, but followed a military career. Together with Marinos Harbouris, he helped Georgios Papazolis convince the Orlov brothers to start their campaign in the Ottoman Empire. Marinos Harbouris was therefore one of the many Ionians (and other Greeks) who settled in Russia for a career. In the early 19th century, Ioannis Kapodistrias, the most prominent Greek Ionian – in 1828 he became the first Governor of Greece – achieved a distinguished career in the Russian Foreign Ministry. Thus, the personal connections of Harbouris and the family and professional networks of Ionian and other Greek-speaking scholars significantly helped him advance his career prospects in the Russian environment. 24Marinos Harbouris or Carburi, as he was known at the time, was born in Argostoli, Cefalonia in 1729. Along with his brother, he studied Physics and Mathematics in Bologna, but after his studies there Harbouris killed his mistress in a fit of jealousy (Many years later he confessed this in writing, albeit indirectly). He escaped prison by joining the Austrian army for two years. When he moved to Russia in 1763, Petros Melissinos gave him a job in the office of the French director of the engineering department of the military school. Harbouris thrived; though there are conflicting sources on his time in Russia, it is clear that he met Empress Catherine, entered the aristocratic circles of the administration and married the daughter of a Foreign Office minister. Harbouris almost certainly met Voulgaris as well as other Greeks in the Russian court. 25Information about his time in Russia and his engineering achievement comes from his book and the one written in 1843 by Mazarakis. When Empress Catherine decided to erect a statue of Peter the Great on a pedestal, Harbouris insisted that it be placed on a single stone; he found a suitable one fourteen kilometers from St. Petersburg. Both the sculptor and the minister of public works supported the idea, and Catherine promised seven thousand rubles to the man who managed the impossible task. Harbouris used all his engineering knowledge to lift the huge rock, transport it over land and sea and bring it to St Petersburg on 22 September 1769, at the enormous cost of 70,000 rubles. He directed workmen to wait for the ground to freeze, and then had the stone dragged over the ice to the sea for shipment and transport to the city. This was made possible by his development of a metallic sledge that slid over bronze spheres about 13.5 cm (6 inches) in diameter, over a track, a device that foreshadowed the later invention of ball bearings. Making the feat even more impressive was the fact that no animals or machines were used in bringing the stone from the original site to Senate Square. It took 400 men nine months to move the stone, and during that time master stonecutters continuously shaped the enormous granite monolith, their progress overseen by Catherine, who visited periodically. Once it arrived at the sea, it was put on an enormous barge that had been constructed exclusively for the task; the vessel was supported on either side by two full-size warships. After a short voyage, the stone reached its destination in 1770, after nearly two years of work. The engineering accomplishment earned Harbouris international acclaim and Russian titles and offices. Although he never received the Empress’ promised award, he did receive support for the plantation works he developed in Cefalonia. 26After his wife’s death, in 1777, Harbouris and his children left Russia; when their ship sunk in the Baltic, Harbouris lost one of his children and all his belongings. He moved to Paris and settled with his brother, a physician at the royal court; he spent two years in aristocratic and educational circles there and published his account of the rock’s transport, with tables and designs of instruments used in the process (fig. 2). 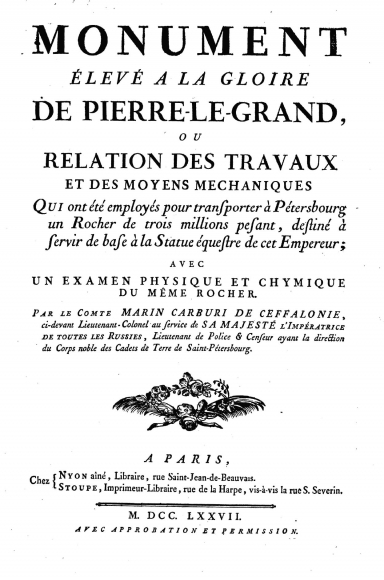 Figure 2: The cover of Harbouris’ book published in 1777. 25 Virgilio Giormani, Maria Cecilia Ghetti, “Marino Carburi”, op. cit. 27Harbouris’ text tells a story of technical expertise that left no material trace, except of course the rock itself – on which the statue of Peter the Great still stands. The introduction is quite revealing, as it includes an implied confession about Harbouris’ troubled life and youth when he committed the crime that forced him to leave the Venetian Republic for Russia. At that point he was traveling under an assumed name, having taken the name of his family’s town24. In France, Harbouris became interested in agricultural progress and innovations. He studied agronomy and befriended a French agronomist, and he began looking for an entrepreneurial adventure that would benefit his native island. Harbouris knew a part of the island that was marshland and thus seemed unfit for cultivation: trusting his knowledge of engineering, agronomy, natural history and chemistry, he became convinced that he could grow indigo, sugarcane, coffee, rice and other colonial plants there25. 28Harbouris had two careers: first he excelled in the world of Ionian scholars educated in Italy, France, Switzerland or Germany who worked in foreign administration, universities and in European courts, particularly Russia, as doctors and educators. After becoming known as a brilliant mathematician-engineer, Harbouris became a colonial-style agricultural entrepreneur who transplanted ideas as well as crops: he successfully navigated Venetian authorities and their restrictions, Russian opportunities and ambitions and the French milieu that accommodated itinerant innovators and their adventurous experimenting. The second career of Marinos Harbouris is mainly a story of transplant and cultivation projects of indigo, sugar, cotton and coffee, of plants, planters, local politicians, empires, and markets. “Savants” planters, chemists and botanists experimented with indigo cultivation and manufacturing from the 16th through early 20th centuries, with the experimentation peaking in the 18th century. 28 Βιογραφίαι των ενδόξων ανδρών, op. cit., p. 157-158. 29Harbouris presented his plan to Empress Catherine, who promised to fund it, excited perhaps by the promise of some form of Russian economic penetration in the Mediterranean. Though by then fifty years old, Harbouris had remarried in France, and the couple decided to start afresh. Once he knew that his crime of attempted murder was no longer investigated and he was pardoned for it, he returned to Cefalonia in 1779, secured the license from the Venetian authorities to exploit the land in Livatho, started building innovative drainage works and brought workers from Mani in Laconia to start cultivating cotton, indigo and sugarcane. He had the support of Giacomo Nani, the governor of Cefalonia and an old friend26. Nani personally inspected Harbouris’ project, viewing his “experiments with exotic plants, among which indigo came to maturity27”. Nani conveyed Harbouris’ promise to demonstrate his first results at the end of the fourth year and sent a sample of indigo to Venice for approval28. 30Venetians praised Harbouris and his engineering and drainage works. Most interesting is the transmission of knowledge from Paris to Cefalonia, given that cotton was also cultivated. Even in the small area that was under cultivation, the planting of new crops and draining of the marshland was exceptionally demanding. It was worth it, however, to Harbouris, as draining the marshland would benefit the health of the inhabitants of Livatho as well as potentially improving their income. Harbouris met his business partners Idaster, a musician as well as an agronomist, and another French agronomist Bandu, who was experienced in the cultivation of colonial plants, in Venice. The fact that the forty workers – a considerable workforce for the time – who were hired to complete the draining works came from Laconia raises questions about why foreign workers were “imported”, although seasonal migration among the Peloponnese and the Ionian Islands was not uncommon. Once the draining was complete, the buildings for the workers were constructed and a mill for the sugar cane was built, a simple structure with a large cistern for molasses. 29 Virgilio Giormani, Maria Cecilia Ghetti, “Marino Carburi”, op. cit. 31On the night of 18 April 1782, about three years after the project started, Harbouris, his servants and fellow agronomist Bandu were murdered in their house. Harbouris’ wife survived, and fled from Cefalonia after being treated for serious injuries. She settled in Corfu; fourteen years later she told her story to Swedish diplomat Pehr Olof von Asp, but it is through the exhaustive account of Giormani and Ghetti and their use of Venetian sources that we know the facts recorded in the long-standing investigation by the Venetian authorities29. Beyond the factual details of what was apparently a premeditated act of revenge for the way Harvouris mistreated his workers and delayed their pay, the story reveals the attempt to transfer and introduce process and product innovation in an agricultural economy that was far from stagnant. 32Harbouris turned his native island of Cefalonia into a field of technical experimentation known in colonial ventures, but little-known in the Mediterranean. His project was the most impressive attempt to introduce cultivation techniques and product innovation on the Ionian Islands. The story also reveals the involvement of Russia in the Mediterranean in the late 18th century and Harbouris’ role as an indirect agent of Russian interests, suggesting that Russia was using “soft power” even as its navy arrived in the Mediterranean. Harbouris’ agricultural experiment was entangled with international politics and Russia’s desire to obtain power in the Mediterranean at the expense of the Ottoman Empire and, to a lesser extent, Venice. 33Although Harbouris’ venture was initially funded by the Russian empire’s imperialist drive, it was Venetian authorities – both locally and in Venice – that facilitated its fruition. Authorities in Venice and Cefalonia sought to transform the island and the economy of the Republic by encouraging industry, agricultural innovation and, of course, trade. The charisma of Harbouris should not be overlooked; his extraordinary life resembles fiction films. Harbouris created opportunities as he went along, demonstrating an impressive ability to convince authorities of the feasibility of his plans and using his family and regional networks to achieve his goals. Harbouris, one could say, is the personification of exile transformed into opportunity. Even if Cefalonia did not become a plantation economy for growing and exporting indigo, sugar and cotton, Harbouris’ project might have provided a sustainable alternative to the currant monoculture and the resulting grain deficit, which in combination with the shipping that took off in the 19th century, led to a diversification of the island’s economy. 30 Βιογραφίαι των ενδόξων ανδρών, op. cit. 34André Grasset de Saint-Sauveur, the French consul in the Ionian Islands at the end of the 18th century, was negative toward Harbouri, while Anthimos Mazarakis, perhaps biased toward a fellow Cefalonian, corrected the French Consul’s account30. Andreas Andreadis, the first Greek economic historian, noted that the information on Harbouris was so contradictory that he could not decide whether Harbouris was a “genius slayed or a crook that received the results of his malevolence31”. The extraordinary adventures and accomplishments of Harbouris should not be shadowed by his violent death and the abrupt end to his entrepreneurial venture; they exemplify the circulation of people, ideas, projects and techniques within Europe, and provide evidence for the complex processes that shaped European modernity. 35What did Eugenios Voulgaris and Marinos Harbouris have in common? The former was a man of letters and spiritual aspiration, the latter a man of passion and mechanical inventiveness. However, both originated in the Ionian Islands, and their careers and itineraries bear witness to the dynamism of the intellectual networks connecting the area with the broader European space. In a recent collection concerning the intellectual and political mobility across the Mediterranean, the editors offer a panoramic view of such networks. 36Although this description mostly refers to the 19th century, the image it conveys is representative of a long tradition of mobility in the Mediterranean space, one embodied by our heroes. They moved along the networks connecting their places of origin with central Europe and Russia, and in the course of their displacement they continuously reshaped their identities and allegiances. Their loyalty to Catherine the Great and their commitment to fulfilling her plans was the culmination of this process as they were actively involved with the Empress’ attempts to increase her intellectual and political profile both inside and outside Russia. But they also wandered in the “European” space – at a time when it was not entirely clear what that adjective stood for. Both Voulgaris and Harbouris spent time in intermediate stations, Leipzig for the first, Paris for the second, where they were able to reconstitute their linkages to patronage networks and, more importantly, to recreate their identities. In both cases the second careers that followed their leaving these cities required a transformation of targets, skills and means. Far from being “caught up in the diaspora”, Voulgaris and Harbouris were anything but liminal: if Voulgaris was more of the itinerant intellectual type, the title adventurer – and indeed a brilliant one – seems more fitting for Harbouris. 37Mobility also served as a privileged “site” of knowledge production. Like many of their contemporaries, Voulgaris and Harbouris took advantage of their cultural dislocation to elaborate patterns of distinction and demarcate spaces tailored to their expertise, an expertise that acquired new meanings in their new environments. Translation was a major means for achieving their goals. Voulgaris secured Catherine’s patronage through the translation of the legal text of Nakaz and perpetuated it through the translation and communication of texts that contributed to shaping the Empress’ profile. Harbouris, on the other hand, gained Catherine’s beneficence through the translation of a huge rock and extended it through the translation of colonial plants from their native environment to the intended sphere of Russian interests. More than just a play on words, translation in its double meaning represents what these men were: intermediaries who bridged cultures, interpreted varying interests and accommodated conflicting priorities reflected by their own shifting allegiances. 38Those were also the qualities of the knowledge they produced. If mobility is the context of continuous re-invention of an actor’s identities, translation is the process of production of useful and reliable knowledge. Voulgaris on the theoretical and Harbouris on the technical side elaborated innovative syntheses not destined to survive in the name of truth, but intended to be consumed by the process of economic and political transformation that had become imperative by the end of the 18th century. 1 Αδαμάντιος Κοραής, Υπόμνημα περί της παρούσης καταστάσεως του πολιτισμού εν Ελλάδι, συνταχθέν μεν Γαλλιστί και αναγνωσθέν εις την εταιρίαν των ανθρωποτηρητών (τη 6 Ιανουαρίου 1803), μεταφρασθέν δε υπό Αναστασίου Κωνσταντινίδου [Mémoire sur l’état actuel de la civilisation en Grèce, lu à la Société des Observateurs de l’homme, le 16 Nivôse, an XI (6 janvier 1803)], Athens, 1833, p. 18. Another author who testifies to Voulgaris’ importance is Constantinos Koumas (1777-1836), who is also considered a major representative of the Enlightenment in the Greek intellectual life of the time. See: Κωνσταντίνος Μ. Κούμας, Ιστορία των Ανθρωπίνων πράξεων [History of human affairs], v. 12, Vienna, 1832, p. 559-564. 2 Γεώργιος Αινιάν, Συλλογή ανεκδότων συγγραμμάτων του αοιδήμου Ευγενίου του Βουλγάρεως καί τινων άλλων μετατυπωθέντων [A collection of unpublished writings of the most unforgettable Eugenios Voulgaris and some more of his writings reprinted], 2 vols., Athens, 1838. 3 Κωνσταντίνος Θ. Δημαράς, Νεοελληνικός Διαφωτισμός [Neohellenic Enlightenment] (6th edition), Athens, Ερμής, 1993, p. 15. 4 Παναγιώτης Κονδύλης, Ο Νεοελληνικός Διαφωτισμός: Οι φιλοσοφικές ιδέες [Neohellenic Enlightenment: The philosophical ideas], Athens, Θεμέλιο, 1988. See, also: Ευάγγελος Π. Παπανούτσος (ed. 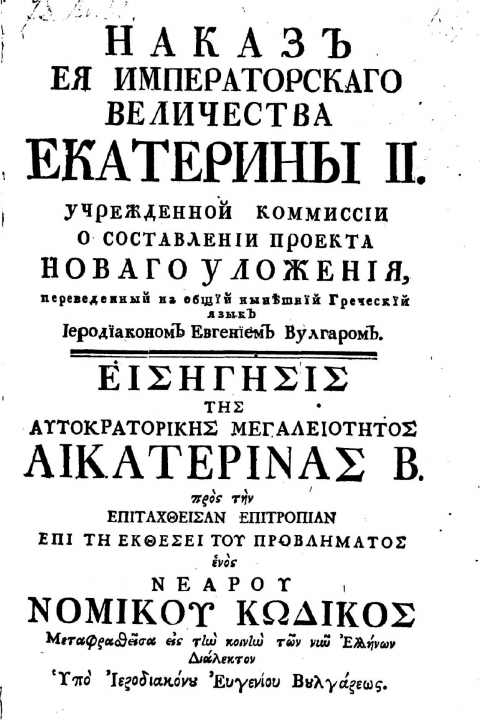 ), Νεοελληνική Φιλοσοφία [Neohellenic Philosophy], vol. 1, Athens, Αετός, 1953, p. 28; Νίκος Ψημμένος (ed. 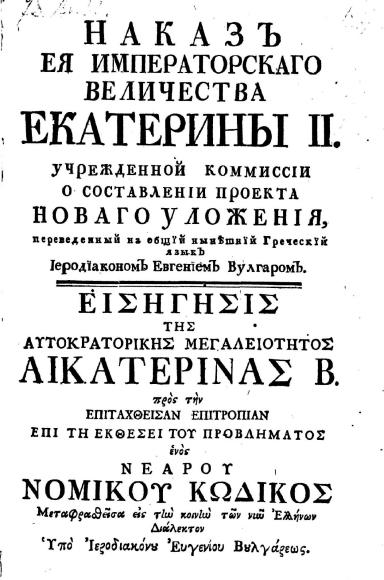 ), Η Ελληνική Φιλοσοφία από το 1453 ως το 1821 [Neohellenic Philosophy from 1453 to 1821], vol. 2, Η επικράτηση της νεωτερικής φιλοσοφίας [The prevalence of modern philosophy], Athens, Γνώση, 1989, p. 32. 5 Mark Harrison, “Science and the British Empire”, Isis, 96, 2005, p. 56-63, p. 63. See also, Lissa Roberts, “Situating science in global history: Local exchanges and networks of circulation”, Itinerario, XXXIII, 2009, p. 9-30 and Manolis Patiniotis, “Between the local and the global: History of science in the European periphery meets post-colonial studies”, Centaurus, 55, 2013, p. 361-384. 6 Simon Schaffer, Lissa Roberts, Kapil Raj, James Delbourgo (eds. ), The Brokered World: Go-Betweens and Global Intelligence, 1770-1820, Sagamore Beach, Science History Publications, 2009. 7 Κωνσταντίνος Κούμας, Ιστορία…, op. cit., p. 559-561; Γεώργιος Αινιάν, Συλλογή…, οp. cit., p. ιγ΄-ιδ΄; Κωνσταντίνος Χατζόπουλος, Ελληνικά σχολεία στην περίοδο της οθωμανικής κυριαρχίας (1453-1821) [Greek schools in the period of the Ottoman rule (1453-1821)], Thessaloniki, Βάνιας, 1991, p. 94; Άλκης Αγγέλου, Των Φώτων [Of the Lights], Athens, Ερμής, 1963, p. 111-132. 8 Manolis Patiniotis, “Eclecticism and appropriation of the new scientific methods by the Greek-speaking scholars in the Ottoman Empire”, in Feza Günergun, Dhruv Raina (eds. ), Science between Europe and Asia: Historical Studies on the Transmission, Adoption and Adaptation of Knowledge, Dordrecht-Heidelberg-London-New York, Springer, 2011, p. 193-206. 9 Άλκης Αγγέλου (ed. ), Ιωσήπου του Μοισιόδακος, Απολογία [Apologia of Iosipos Misiodax], Athens, Ερμής, 1992, p. 42-43. 10 Stephen K. Batalden, Catherine II’s Greek Prelate. Eugenios Voulgaris in Russia, 1771-1806, New York, Columbia University Press, 1982, p. 15. 11 Άλκης Αγγέλου, Των Φώτων Β΄: Όψεις του Νεοελληνικού Διαφωτισμού [Of the Lights, B: Aspects of the Neohellenic Enlightenment], Athens, Μορφωτικό Ίδρυμα Εθνικής Τραπέζης, 1999, p. 68-69; Stephen K. Batalden, Catherine II’s Greek Prelate…, op. cit., p. 29. 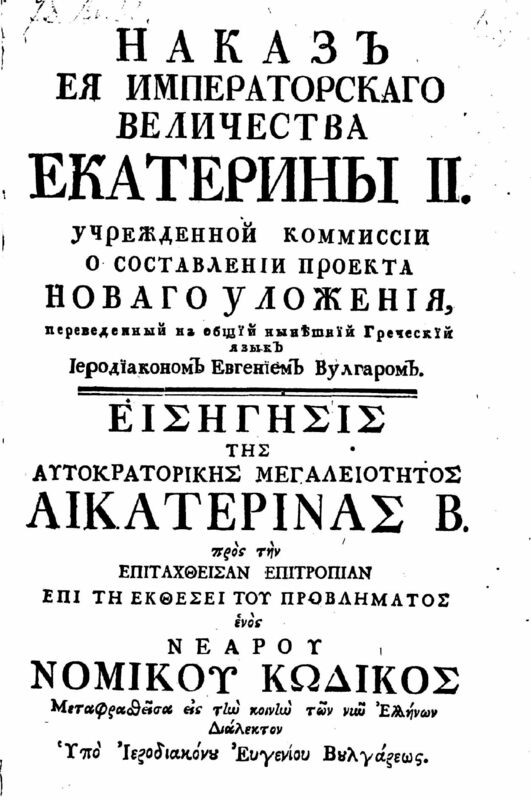 12 There is a detailed exposition of Voulgaris’ life and travels in the Russian Empire in Stephen K. Batalden, Catherine II’s Greek Prelate…, op. cit. 13 Γεωργία Πέτρου, “O Ευγένιος Βούλγαρης (1716-1806) και η Βασιλική Εταιρεία του Λονδίνου” [Eugenios Voulgaris (1716-1806) and the Royal Society of London], Νεύσις, 10, 2001, p. 181-198. 18 For the concept of useful and reliable knowledge in the context of the growing field of Global History, see Ian Inkster, “Potentially global: ‘useful and reliable knowledge’ and material progress in Europe, 1474-1914”, The International History Review, 28-2, 2006, p. 237-286; Patrick O’Brien, “Historical foundations for a global perspective on the emergence of a western European regime for the discovery, development, and diffusion of useful and reliable knowledge”, Journal of Global History, 8, 2013, p. 1-24; Simona Valeriani, “The making of useful knowledge in Europe, 1400-1800”, in Patrick O’Brien (ed. ), Useful and Reliable Knowledge in the East and the West, Cambridge, Cambridge University Press, forthcoming. 19 Βιογραφίαι των ενδόξων ανδρών της νήσου Κεφαλληνίας συγγραφείσαι υπό Ανθίμου Μαζαράκη Ιερέως, Εν Βενετία 1843 [Biographies of illustrious men of the island of Cefalonia, by the priest Anthimos Mazarakis, Venice, 1843], (reprinted by Βιβλιοπωλείο Νότη Καραβία, Athens, 1999). 20 Petrie Harbouri, The Brothers Carburi, Bloomsbury, London, 2002. The film can be seen at: https://www.youtube.com/watch?v=_o_nvfQ-3B0 (accessed 4 October 2016). 21 Virgilio Giormani, Maria Cecilia Ghetti, “Marino Carburi (Cefalonia, 1729-1782): Un avventuriero onorato”, Studi Veneziani, LVI, 2008, p. 361-473, and their previous works “Alcuni aspetti della vita del cefaleno Marino Carburi (1729-1782)” in the Proceedings of the VIth International Panionian Congress, Zakynthos, 23-27 September 1997, Athens, Center for Ionian Studies, Society for Zakynthian Studies, 2001, p. 337-348. 22 Γ.Α. Λαζάρου, Ι. Λασκαράτος, “Η ιατρική οικογένεια Σκιαδά στη Ρωσία του 18ου αιώνα” [The medical family of Skiadas in 18th-century Russia], Αρχεία Ελληνικής Ιατρικής, 18-1, 2001, p. 80-83. 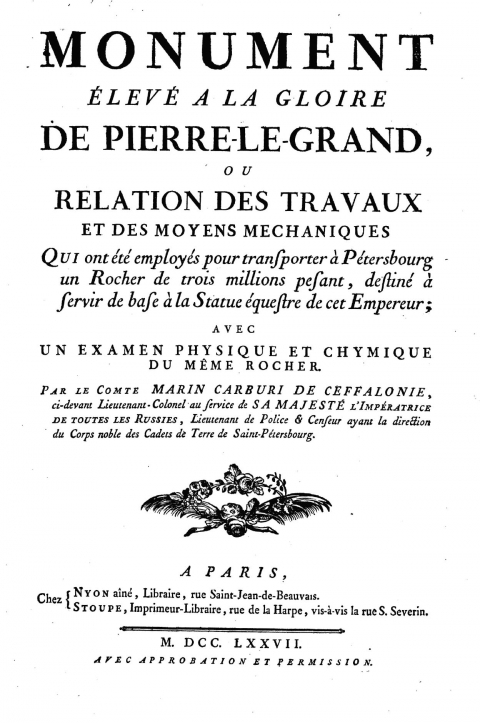 24 Marin Carburi, Monument élevé à la gloire de Pierre le Grand, ou relation des travaux et des moyens méchaniques, Paris, 1777, p. 3-4. 31 Ανδρέας Μιχ. Ανδρεάδης, Περί της οικονομικής διοικήσεως της Επτανήσου [On the economic administration of the Ionian Islands], Eν Αθήναις, Τυπογραφείον “Εστία”, 1914 (reprinted by Βιβλιοπωλείο Νότη Καραβία, Athens, 1994), vol. 2, p. 139. 32 Maurizio Isabella and Konstantina Zanou, Mediterranean Diasporas: Politics and Ideas in the Long 19th Century, London, Bloomsbury, 2016, p. 6. Manolis Patiniotis et Sakis Gekas, « Greek Travelers in Eastern Europe at the End of the 18th Century: Shifting Identities and the Production of Knowledge across Borders », Diasporas, 29 | 2017, 17-32. Manolis Patiniotis is an associate professor at the department of History and Philosophy of Science, National and Kapodistrian University of Athens. He teaches courses on the history of Scientific Revolution, the history of the sciences during the Enlightenment and the historiography of science and technology. He is the author of the monograph Elements of Natural Philosophy: The Greek scientific thought in the 17th and the 18th centuries (Gutenberg, Athens, 2013) and of the paper “Between the local and the global: History of science in the European periphery meets post-colonial studies” (Centaurus, 55, 2013). He has also co-authored with Pedro Raposo the article “Beyond fixed geographies: Moving localities and the making of knowledge” (Technology and Culture, 57, 2016). He is a founding member of the international research group STEP (Science and Technology in the European Periphery). Manolis Patiniotis est maître de conférences au département d’histoire et de philosophie des sciences à l’université nationale et capodistrienne d’Athènes. Il dispense des cours sur l’histoire de la révolution scientifique, sur l’histoire des sciences pendant les Lumières et sur l’historiographie des sciences et de la technologie. Il est l’auteur d’une monographie, Elements of Natural Philosophy: The Greek scientific thought in the 17th and the 18th centuries (Gutenberg, Athènes, 2013), ainsi que d’un article, « Between the local and the global: History of science in the European periphery meets post-colonial studies » (Centaurus, 55, 2013). Il a également coécrit avec Pedro Raposo l’article « Beyond fixed geographies: Moving localities and the making of knowledge » (Technology and Culture, 57, 2016). Il est un des membres fondateurs du groupe international de recherche STEP (Science et technologie en périphérie de l’Europe). Sakis Gekas is an associate professor and Hellenic Heritage Foundation Chair in Modern Greek History at the Department of History, York University, Toronto. He teaches Modern Greek, Mediterranean and European History and the history of Greek migration and diaspora. He is the author of the monograph Xenocracy. State, Class and Colonialism in the Ionian Islands, 1815-1864 (Berghahn, 2017), and of articles on the Ionian Islands under British rule, on merchants and ports in the Mediterranean, and on the economic history of 19th-century Greece. Sakis Gekas est maître de conférences en histoire moderne grecque à l’université York à Toronto (Hellenic Heritage Foundation Chair in Modern Greek History). Il enseigne le grec moderne, l’histoire européenne et méditerranéenne et l’histoire des migrations et diaspora grecques. Il est l’auteur d’une monographie, Xenocracy. State, Class and Colonialism in the Ionian Islands, 1815-1864 (Berghahn 2017), ainsi que d’articles sur les îles Ioniennes sous autorité britannique, sur les marchands et les ports de la Méditerranée, et sur l’histoire économique du xixe siècle en Grèce.